TUCSON, AZ (Tucson News Now) - The Colorado River basin reaches from Wyoming through Colorado and Utah before making up the border between Arizona and part of Nevada plus California before flowing across the border and into Mexico, ending at the Gulf of California. But since 1960, the river hasn't reached the Gulf, except during a few very wet years. That changed last year when the salty Gulf water connected with fresh water from the river on May 15th during a 'pulse flow', which was meant to mimic the spring flood. 90% of the Colorado River water coming out of Lake Mead goes to crop irrigation, plus household and business use in Arizona, Nevada, and Southern California. 10 percent of that goes to Mexico, where much of it is diverted for crop irrigation as well. Last year an agreement between the U.S. and Mexico sent one percent of that flow further into Mexico and towards the Gulf of California. Karl Flessa, a University of Arizona professor of geosciences involved in the project, said the Colorado River water only mixed with the Gulf of California waters for about a week last year. However he points out that smaller subsequent flows that didn't reach the Gulf still led to greener conditions on the delta. Karl says these smaller flows "soak into the river bed (where they get used by the trees) long before they get as far as the Gulf of California." The agreement says the increased water flow will happen for 5 years. During that time, scientists will study the impact of this increased water availability on plants and animals in the delta. Until 1998, there were no comprehensive studies of the delta's health. Note, that is after the diversion of the water. This new flow allows scientists to research how the fresh water will change the health of the delta. Click here for a video detailing this research. 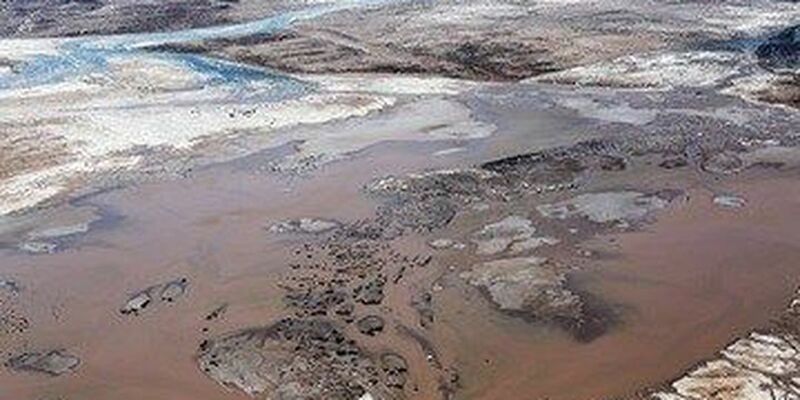 Below is a picture of the Colorado River connecting with the Gulf of California on May 15, 2014. The Colorado River connects with a high tide from the Gulf of California on May 15. Credit: Francisco Zamora, Sonoran Institute, with aerial support from LightHawk. Click here for more information on this partnership between the University of Arizona and other entities that made this happen.